So begins the story of two orphaned sisters at Mrs. Mondayâs Boarding School. 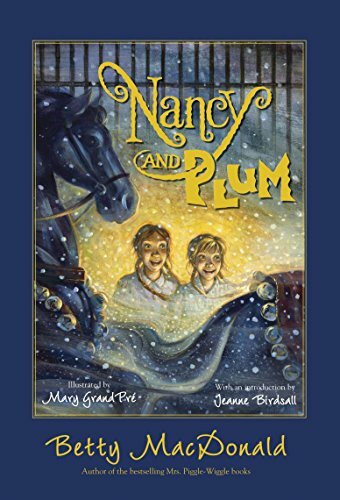 But nothing is heavenly for Nancy and Pamela (aka Plum): their parents died in a tragic accident years ago, theyâre constantly punished by the cruel Mrs. Monday, and theyâre all alone for the holidays. Luckily, Nancy and Plum have each other, and though their prospects may be bleak, theyâre determined to change their lot for the better. If their plan works, the spirited sisters will never spend Christmas at the cold, dark boarding school again. But what will they find on the other side of Mrs. Mondayâs gate? Adventure, warmth, unforgettable characters, and unexpected kindness abound in this classic story by Betty MacDonald, which was originally published in 1952. With illustrations by the acclaimed Mary GrandPrÃ© and an introduction by Jeanne Birdsall, National Book Awardâwinning author of The Penderwicks, this edition introduces the spunky, beloved heroines to a new generation of fans. About: It was Christmas Eve.